Eshiels Gundogs. Training. Stud Dogs. Breeding. New weekly puppy training classes for all breeds. Eshiels Gundogs is owned and run by Ian and Andrea Mitchell. 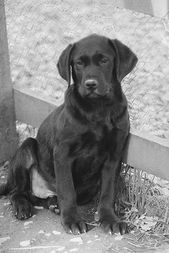 We at Eshiels offer professional gundog and pet training. New for 2019 is our training services for those wanting to train their dog to be a mountain bike trail dog. We love what we do. Our Luxury Dog Boarding Kennels are suitable for all breeds and fully heated and licensed. We attract customers from Peebles, Edinburgh, Glasgow, Lothians, Scottish Borders, Fife, Perthshire and Newcastle. We are based near Peebles in the beautiful Scottish Borders 30 minutes south of Edinburgh. We have plenty of quality ground to train and exercise our dogs on including rivers and ponds for water work. We test our labs for hips, elbows, and eyes. Our Spaniels are tested for eyes, FN, and PRA. Our breeding programme is always aimed at improving the breed. We do not breed just for trialling dogs, but all round dogs that are happy in all environments. We are general looking at producing two quality litters per year. Our pups are bred for working ability, conformation and temperament. Our puppies to go working and pet homes. Their welfare is more important than the type of home they go too. We offer a number of different training options to suit the individual and their dog. We like to see dogs that their owners are proud of. Generally young pups and their owners would benefit from a few one to one's to get the basics first. Then introduced in to group classes. We also offer training days for a small amount of handlers, and residential training for those that require it. If you are looking for a particular pup or dog and we have nothing suitable advertised please let us know and we will try and help. We often hear about litters available or litters that are planned via our contacts in the shooting world. We also have trained dogs for sale from time to time, most do not get advertised. The dogs you see on our website are those that we use for work or are planning to work on a regular basis. Eshiels Boarding and Training Kennels. Andrea Mitchell 07973 752148 Boarding. Ian Mitchell 07581 517185 Training.